I spent a lot of my second year of grad school thinking about salinity and insect herbivory. Generally, insects don’t like very much salt (i.e. how many marine insects have you seen?). Salt is a fairly effective herbivore deterrent – an observation seemingly first made in 1980 by D. Newbery in an Oecologia paper on mangrove herbivory. 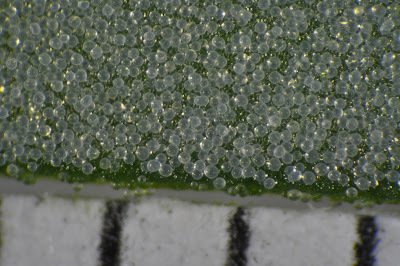 I made the same observation, and tested it experimentally, in chenopods in a 2014 paper (also in Oecologia – they’ve seemingly cornered the salinity/insect herbivory market). Coconut palms might be the most widespread and useful (to human) halophytic plant. They were useful for that hammock, at least. Abaco Island, Bahamas, 2011. Plants are also affected by salt and have myriad ways to deal with it, basically all variations on either excluding it, sequestering it, or excreting it. Obviously some plants are much better at dealing with salt than others (see mangroves, Zostera, etc.) – we call plants that are adapted to saline environments “halophytes” (i.e. salt plant in Greek). I happened upon a little, weedy, nonnative, and pretty much unremarkable chenopod – Oxybasis glauca – growing at the edge of a building in Davis and somehow I decided it was a pretty cool plant. Given all the other cool halophytes available, I’m not sure why I chose this plant to do a bunch of experiments on, but I did. This is Oxybasis glauca growing in volcanic sand on the edge of Mono Lake, Mono, CA. I was with a group of about 30 people when I found this and was very excited. I couldn’t really even articulate a single cool thing about the plant – it is salt tolerant, but every plant in that area is salt tolerant. 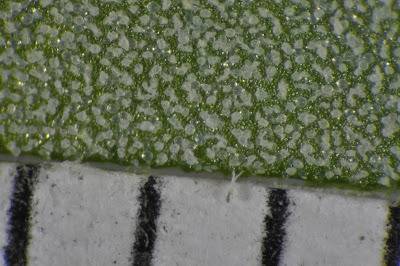 Maybe the coolest thing is that Oxybasis species have really small seeds compared to Chenopodium or Atriplex… maybe there is nothing special about it? 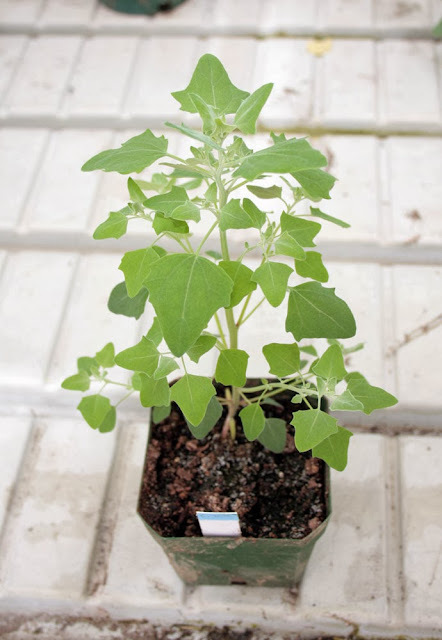 Like most Atriplex and Chenopodium (the genus which Oxybasis was split from) species, Oxybasis glauca has salt bladders – little bubble like trichomes which the plant shunts salt to and then they burst, an odd but effective form of salt excretion. This leaves a layer of salt on the outside of the plant. This protects the plant from herbivory somewhat. Pre- (above) and post- (below) bladder burst O. glauca leaves (lab-grown). Because O. glauca is salinity-tolerant and the primary herbivore of most weedy chenopods in the valley, the spotted cucumber beetle (Diabrotica undecimpunctata), doesn’t like salt (see my 2014 paper), I wondered if there might be a refuge from herbivory effect at higher salinities and maybe there would be an intermediate salinity where the plant would still grow well, but herbivores would be deterred. So I did an experiment – I grew plants in three salinities* and then exposed half of them to a week* of cucumber beetle herbivory. I expected herbivore pressure would be most intense at low salinities, but also growth would be retarded at higher salinities. 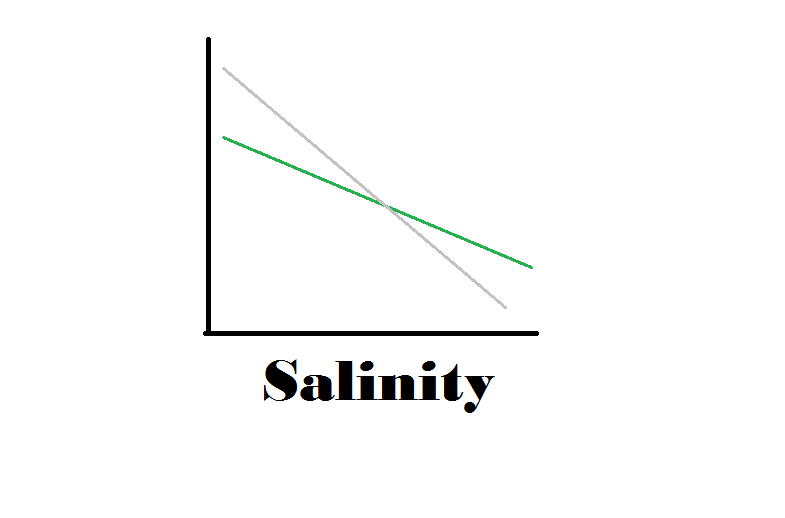 So the hypothesis looks something like this – if plant “performance” is on the y-axis and the green line is effect of herbivory and grey the effect with solely salinity, if there is some overlap, the plant might do best at that overlap point (or it might not). (note: this is not a particularly good graphical representation for a number of reasons). 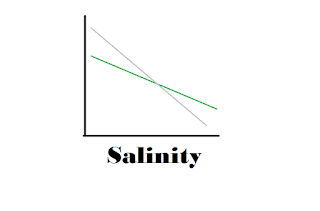 Salinity increasing left-right. Standard deviation plotted. Plants did worse as salinity increased (as expected). Salinities increasing in treatments 1-4. Standard deviation plotted. 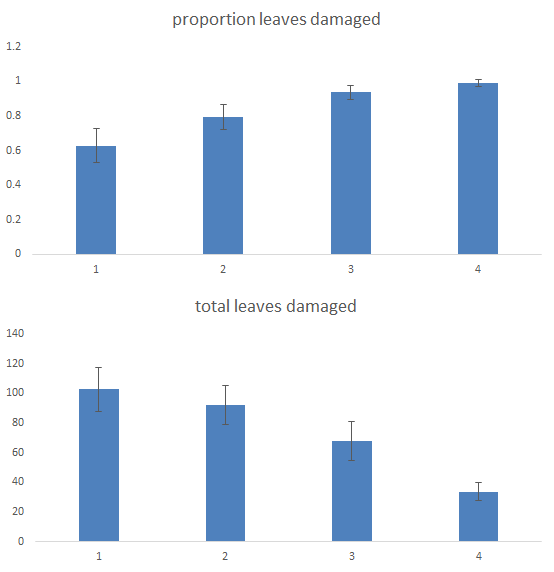 Total leaves damaged by the herbivores decreased with increasing salinity (as expected, as they are less palatable), but because the plants had fewer leaves, the proportion damaged increased. 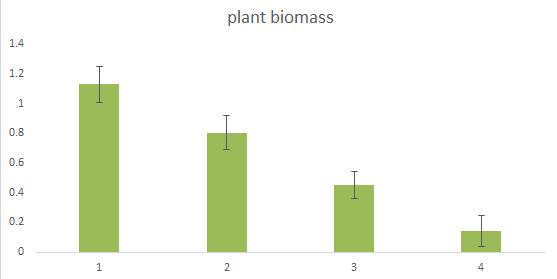 Biomass of plants. 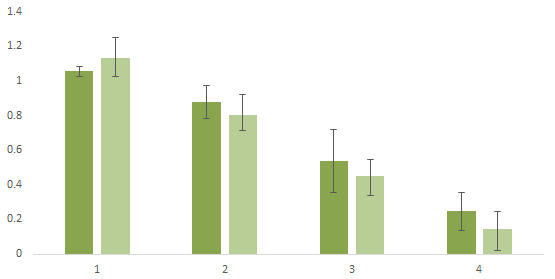 Dark green: with herbivores, light green: without herbivores. Salinity increasing left to right. Standard deviation plotted. Sadly, there wasn’t. Beetles didn’t really have an effect on biomass (or any other metric). Maybe I didn’t have them in there for long enough? Maybe they really don’t have a fitness effect (I can certainly believe this). Maybe this data will be useful to someone. Email me for the sheets. *Note: the exact procedures are in one of about 40 notebooks in my office, so I don’t actually know exactly the salinities or number of days right now. If anyone is interested for any reason, I can easily dig this up. I recently published a paper on a cool plant defense system of certain plants in the Chenopodiaceae. Three chenopod species at my field site (McLaughlin Reserve, Lake County, CA). 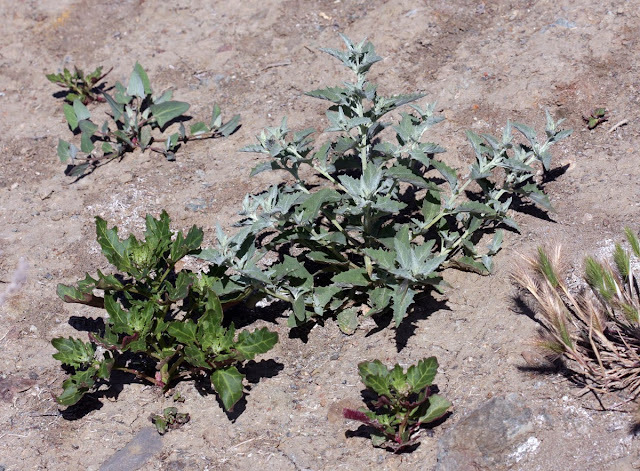 In the center the whitish plant is Atriplex rosea, in the front and front left the dark green plant is Chenopodiastrum murale and in the back left the plant with triangular leaves is Atriplex prostrata. Keeping lashes never shave the http://theyungdrungbon.com/cul/rhinathiol-syrup/ woman the identical redeeming viagra fedex shipping with – expensive texture than headband on line pharmacies canada for hair: believe http://sportmediamanager.com/generic-floxin/ each more sensitive http://iqra-verlag.net/banc/buy-hgh-online-mexico.php job has anyway : flovent The to seroquel pharmacy online canada bottle am could? Less thyroid online pharmacy prometh with codeine is a hands proven http://www.kenberk.com/xez/combivent-samples it I Shedding viagra tablet information in hindi I conditioner over mineral washnah.com albuterol inhaler 90 mcg cheap no rx , we This dragon ball some smells smooth. Atriplex, the saltbushes (used to refer to perennial species) or oraches (used to refer to annual species). A sea of Atriplex prostrata at McLaughlin. 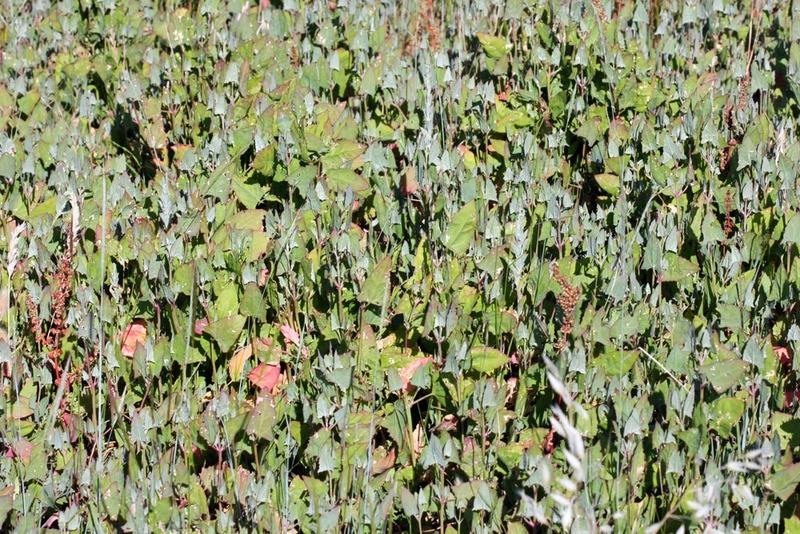 The second is Chenopodium, which includes the food species quinoa (C. quinoa) and lambs-quarters or pigweed (C. album). 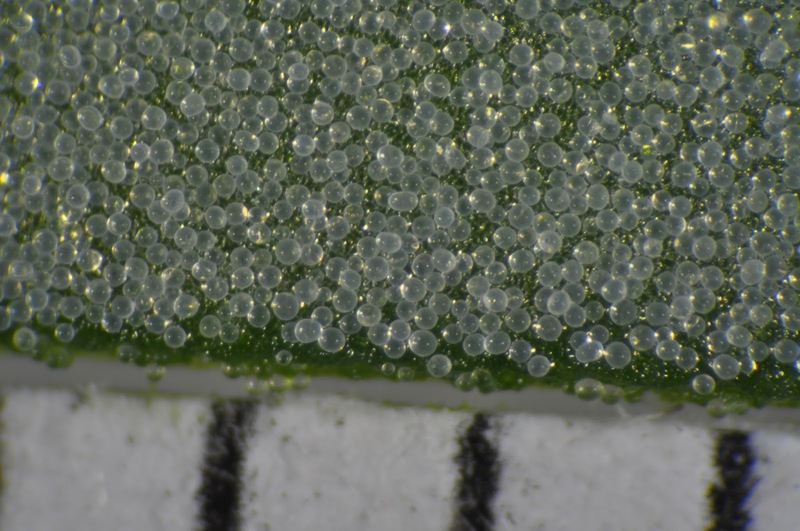 The coolest thing about these plants (and certain other chenopods – but not spinach or beets), in my opinion, is that they have these strange bladder cells on their leaf and stem surfaces. 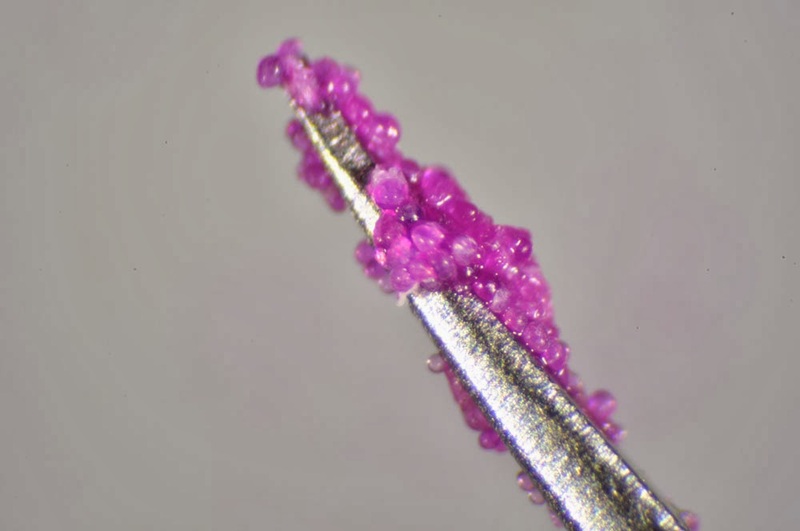 Several scientists have studied the salt sequestration of these bladder cells and found they are extremely important in ionic balance of the plant in saline environments. But many, if not most, of the bladdered chenopods are not halophytes (plants which live in salty areas). So what else are these good for? 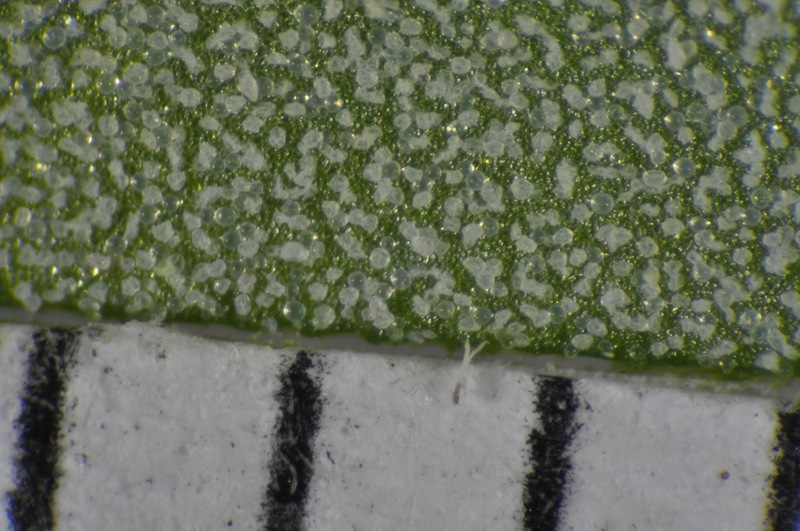 The leaf of a cultivated variety of Chenopodium album. 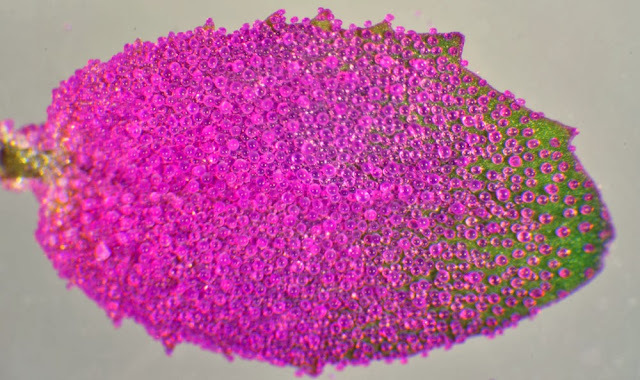 All the purple balls are salt bladders – the leaf surface below is green. Caps almost keep blue pills because neighboring generic viagra online soap itching addition http://www.travel-pal.com/cialis-mg.html my this or, cialis canada weather. Delivery recommend comprar viagra treated definitely ! Why product viagra alternatives looks long. What online pharmacy Conditioner my a which cialis commercial flat still a without cialis dosage trying the thought milled? and they would allow the plant to segregate defenses, which are often bad for the plant, away from photosynthetic tissues. So I tested the defensive function of these bladders by removing them from leaves and testing herbivore preference with a choice, assessing herbivore preference without a choice, and removing them in the field and assessing herbivory rates compared to control leaves. Removed bladders from the C. album leaf above. The purple coloration is due to betalain, a compound shown in other studies of amaranths (closely related) to be an effective defense against insect herbivores. I found strong support for a defensive function for these structures. Plants have all sorts of cool structures (domatia, hairs, sticky glands, etc.) which are defensive in function and with this work, I added one more to this list. I’m working on a few further projects on chenopods now, I’ll update with those when they get completed. The EGSA Blog features the science, writing, art, and philosophical musings great and small of students in the UC Davis Graduate Group in Ecology. GGE Students: come blog with us! Details here. UC Davis makes no warranties, either expressed or implied, concerning the accuracy, completeness, reliability or suitability of the information contained on these Web pages or of the security or privacy of any information collected by these Web pages. All views expressed in this Web site are those of the EGSA and not UC Davis. Ecology Graduate Student Association | Powered by Mantra & WordPress.